Within Modules, you can view the progress of your students and see how they are progressing through the course. Module progress is determined by the students completing required elements in the module. If you don't set up any requirements, you won't be able to track your students' progress within each module. Required elements may include requiring the students viewing a page, submitting an assignment, or earning a minimum score on an assignment or quiz. For more information please see the lessons about setting up prerequisites and adding requirements. Modules displays an overview of each module and the content within each module. Any completion requirements are listed next to the module content item . Prerequisite requirements are posted at the top of the module . To view student progress in your course, click the View Progress button . 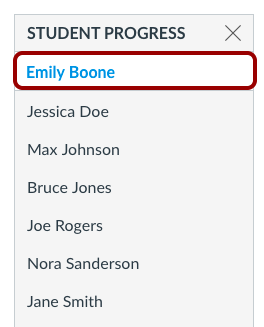 When opening the View Progress window, Canvas will always default to show the first student in your course (listed alphabetically by last name). To view progress for another student, click the student's name in the Student Progress list. The Module Progress window shows the progress of each student in your course. Modules can be completed, in progress, or locked. Modules that have no completion requirements, or modules where the students have completed the requirements, will be marked as completed. If a student is in the middle of a module, the module will be marked as in progress. If a module cannot yet be accessed by the student because of completion or prerequisite requirements, the module will be marked as locked. 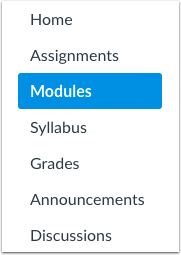 Student progress is displayed showing the state of each module. To learn more about what a student is accessing, visit the access report lesson. Previous Topic:How do I view the MasteryPaths range breakdown results for an assignment? Next Topic:How do I view course content offline as an HTML file as an instructor? Table of Contents > Modules > How do I use modules to view the progress of students in a course?